110 East Main Street Linden 615 945-4347 http://buffaloriverartisans.indiemade.com/ Open 11 AM–4 PM . 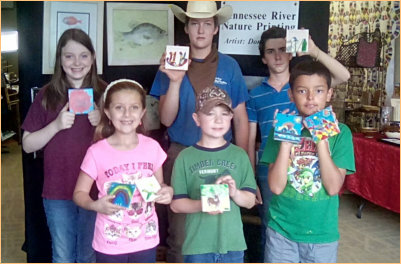 Buffalo River Artisans Cooperative was founded in 2009 by a group of Perry County artists and craftspeople who live and create in the beautiful hills and hollers between the wild Buffalo River and the Tennessee River. Located in downtown Linden, just a few doors down from the historic Commodore Hotel, local artists and craftspeople connect with people interested in supporting creativeness through the Buffalo River Artisans Cooperative gallery/shop. An eclectic assortment of heirloom crafts and fine art are displayed for sale in a wide price range. From its inception, Buffalo River Artisans Cooperative has welcomed diverse makers. Director Melissa Goodwin not only grows the fibers she uses in her textiles but spins and weaves them into beautiful garments and household accessories. Hand thrown pottery often features a bit of whimsy as well as function. Jewelry ranges from intricate beaded items to colorful fused glass. Paintings in a variety of mediums, reflect the rich scenic vistas of Perry County. Other artisans draw on their heritage, basket weaving, handknitting, metalworking, and wood carving. There is something for everyone looking for fine handmade arts and crafts. Check our Facebook page for information about special classes and workshops for budding and accomplished artists and craft workers of all ages. Where local artists and heirloom craftspeople connect with people interested in supporting creativity! Buffalo River Artisans Cooperative was founded in 2009 by a group of Perry County artists and craftspeople who live and create in the beautiful hills and hollers between the wild Buffalo River and the Tennessee River. 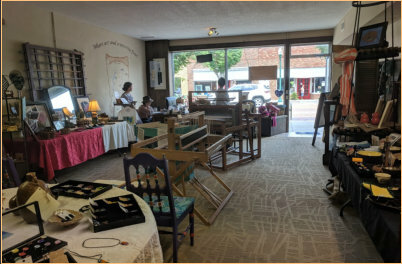 Located in downtown Linden, just a few doors down from the historic Commodore Hotel, local artists and craftspeople connect with people interested in supporting creativeness through the Buffalo River Artisans Cooperative gallery/shop. An eclectic assortment of heirloom crafts and fine art are displayed for sale in a wide price range. From its inception, Buffalo River Artisans Cooperative has welcomed diverse makers. Director Melissa Goodwin not only grows the fibers she uses in her textiles but spins and weaves them into beautiful garments and household accessories. 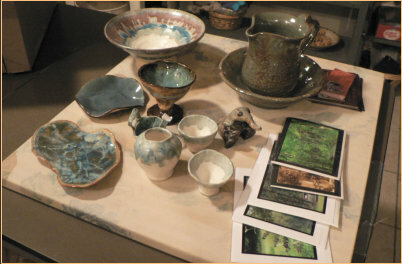 Hand thrown pottery often features a bit of whimsy as well as function. Jewelry ranges from intricate beaded items to colorful fused glass. Paintings in a variety of mediums, reflect the rich scenic vistas of Perry County. Other artisans draw on their heritage, basket weaving, handknitting, metalworking, and wood carving. There is something for everyone looking for fine handmade arts and crafts. Check our Facebook page for information on our classes and workshops for budding and accomplished artists and artisans of all ages!